Hyptis suaveolens (Lamiaceae), a plant traditionally used as a mosquito repellent, has been investigated for repellent properties against nymphs of the tick Ixodes ricinus. Essential oils and volatile compounds of fresh and dried leaves, from plants originating from Laos and Guinea-Bissau, were identified by GC–MS and tested in a tick repellency bioassay. All the essential oils were strongly repellent against the ticks, even though the main volatile constituents differed in their proportions of potentially tick repellent chemicals. (+)/(−)-sabinene were present in high amounts in all preparations, and dominated the emission from dry and fresh leaves together with 1,8-cineol and α-phellandrene. 1,8-Cineol and sabinene were major compounds in the essential oils from H. suaveolens from Laos. Main compounds in H. suaveolens from Guinea-Bissau were (−)-sabinene, limonene and terpinolene. Among the sesquiterpene hydrocarbons identified, α-humulene exhibited strong tick repellency (96.8 %). 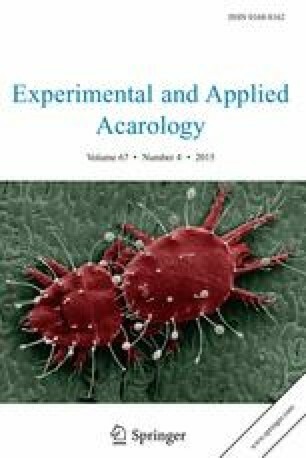 Structure activity studies of oxidation or sulfidation products of germacrene D, α-humulene and β-caryophyllene, showed increased tick repellent activity: of mint sulfide (59.4 %), humulene-6,7-oxide (94.5 %) and caryophyllene-6,7-oxide (96.9 %). The substitution of oxygen with sulfur slightly lowered the repellency. The effects of the constituents in the oils can then be regarded as a trade off between the subsequently lower volatility of the sesquiterpene derivatives compared to the monoterpenes and may thus increase their potential usefulness as tick repellents. Thanks are due to Tao Zhao, KTH for determining the enantiomeric composition of the monoterpenes, and Christina Grusell and Åsa Tysk at the Botanical Garden, Uppsala University for cultivation of Hyptis plants. This work was supported by a Grant-in-Aid for Young Scientists (B) 20780127, and the Swedish International Development Co-operation Agency (Sida/SAREC), the Swedish Research Council for Environment, Agricultural Sciences and Spatial Planning (Formas/SJFR), a joint Formas/Sarec grant and the Mobilitas Top Researcher grant. All authors of this article declare that there are no conflicts of interest. Nor does this article contain any studies with human participants or animals performed by any of the authors. All guidelines for GLP were followed.